I apologize for I am way behind on my posts. I got sick last week Tuesday and am finally feeling almost normal today although I still have unexpected and frenetic coughing spasms. 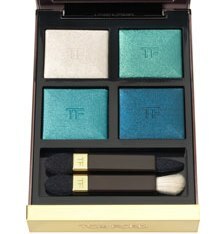 Just prior to getting sick, I had been seeing posts about Tom Ford Emerald Lust eyeshadow quad palette and fell in love with it. Who else has been lemming it? Unfortunately with its high price tag, I wasn't willing to purchase it and thought that perhaps I could rummage through my stash and come up with some similar colors. I haven't seen the quad in person so I wasn't quite sure what the colors look like in actuality. On some blogs it looked more blue and on others it looked more turquoise/green. This picture that I have is from Neiman Marcus website. After applying eyeshadow primer, I applied Mystic Mirage to contour area of eyelids. Endless Sea to inner 1/3 of eyelid, Unhinged to middle 1/3 of eyelid and the lighter of the YSL blue eyeshadow to outer 1/3 of eyelid. I also applied very lightly GA ETK #23, which is almost a holographic eyeshadow, over the various blue eyeshadows to blend them together. Since there are micro glitters of blues and greens, it also helps to stay within the color theme of the eyeshadows. K-Palette eyeliner lines the upper lashline and just a smidge in the outer corner of lower lashline, to make a seamless transition from the upper lashline to the lower lashline at that outer corner. Using the darkest blue eyeshadow from YSL, I line the outer half of lower lashline starting at outer corner and fading it in towards the middle. I also use it in the outer V of upper eyelid and blend the color in, emphasizing the outer corners. To glam it up for an evening out, I added mascara and Sephora silver glitter eyeliner to the inner corner of lower lash line. Unfortunately, no matter how hard I tried, I couldn't get it to show up in the picture well. I could have also used MAC Freshwater and Contrast instead of YSL palette. All in all, I was pretty happy with my substitutes for Tom Ford's Emerald Lust palette. I hope that everyone is well and gearing up for the holiday season. I love this idea! I often look at new releases and wonder if I have the same shades in my collection or at least dupes. The Tom Ford looks lovely, but I think your being resourceful is even better! Looks beautiful on you as well! Thanks Brianna! I really liked the look of the Tom Ford palette but couldn't justify paying that much for it when I have so many similar colors at home. I'm glad that I was able to find enough similar colors to make it work.